Green has always been my favorite color, particularly the basic green in an old box of Crayola 8 crayons. That simple green that I used to fill in my Bugs Bunny coloring books still holds a special place in my heart. Of course, other greens are appealing, too — kelly, emerald, forest, sage, basil. A grove of evergreens during a hike, a refreshing twist of lime in your drink on a hot day, the outfield on opening day, the head of a mallard duck, shamrocks, that US$20 you found in your jeans on laundry day — there are plenty of hues and shades of this cool, calming color to make you smile. These are my favorites. 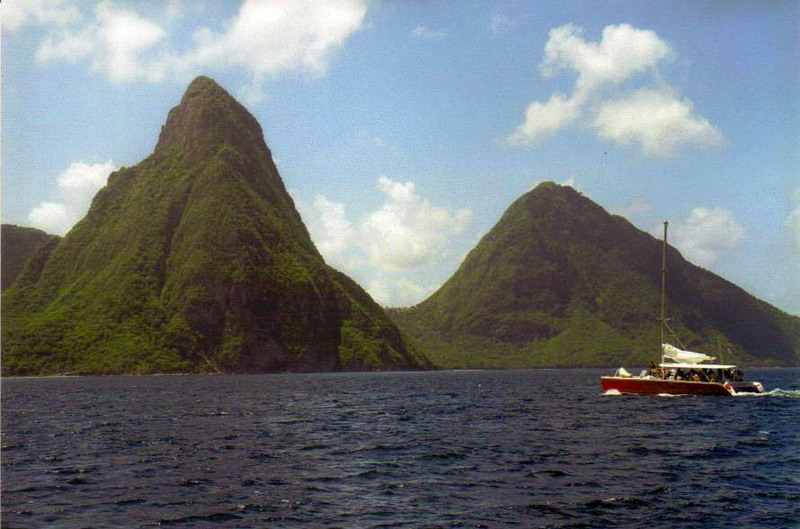 The sailboat I was on glided down the western coast of St. Lucia. Heading south, with a tropical drink in hand, I was excited to soon be arriving at the Pitons, this Caribbean island’s iconic natural feature. Sure enough, as we passed Anse Chastenet Beach and entered Soufriere Bay, they came into view at the opposite end. Breezing by the capital city of Soufriere, these two mountainous volcanic plugs rose before me from the sea like a pair of giant green triangles. Bookending Jalousie Beach, the Pitons are so beautiful and famous — they’re regarded as the most photographed site in the Caribbean and the most famous mountain pair in the world — that UNESCO added them to its World Heritage List in 2004. Created less than one million years ago by volcanic activity, the taller Gros Piton rises to 2,619 feet, while its smaller partner, Petit Piton, reaches 2,461 feet. From the sea, the tropical moist forest that looks like a uniform green carpet covering both of these pinnacles is actually composed of 148 different plant species on Gros Piton and 97 on Petit Piton. September and October are often the best months to view them in all their glorious green, following the rainy season, but the Pitons remain impressive in any season, so much so that the local beer, a pilsner brewed since 1992, bears their name as its brand. In 1823, a workman at the Papal Basilica of St. Paul Outside the Walls in Rome accidentally started a fire on the roof that almost completely destroyed the basilica, which had changed little over its 1,400-year life. The then pope, Leo XII, issued a document calling for donations to rebuild the church, and they started to pour in, not only from multitudes of ordinary Catholics but also from world leaders. The resulting reconstruct from 1840 stands as one of the most beautiful churches in Rome (and the home of the tomb of St. Paul), with much to admire — gorgeous colonnades and columns, wonderful coffered ceilings, and invaluable mosaics. My favorite feature came to the church from Russian Tsar Nicholas I, who donated blocks of malachite that were used for the two striking lateral altars of the transept. 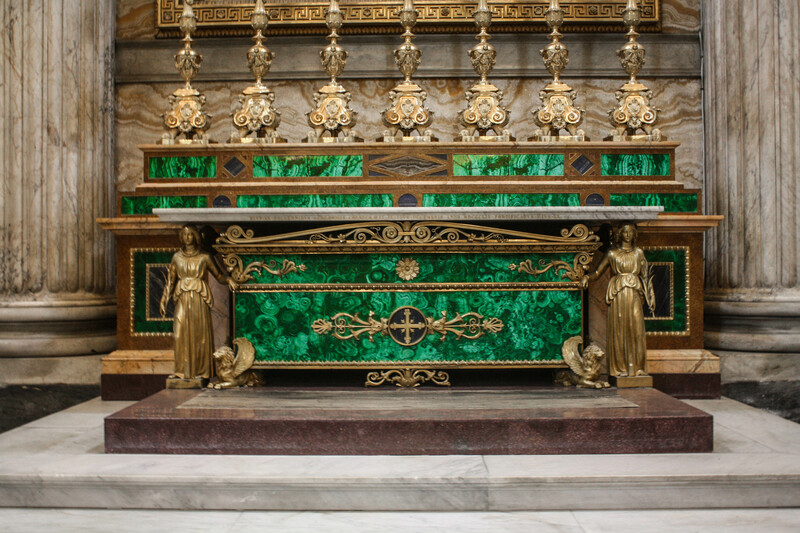 The identical altars — the Altar of the Conversion of St. Paul on the left, the Altar of Our lady of the Assumption on the right — employ liberal use of the highly polished malachite, an opaque, green banded mineral. A large chest, supported on feet of winged lions and topped with a marble slab that rests atop the heads of robed female figures, is almost entirely clad in malachite. Behind it, bands of bright-green malachite run along the taller portion of the altar, which supports seven tall candleholders, six with white candles and the central one with a crucifix. Punctuated with deep blue lapis lazuli (also a gift from the tsar) and framed and detailed with gold, the green truly does pop, catching your eye in a flash of spectacular color amid all the beige columns, walls, and statues around it. I was finishing a three-week romp around Ireland. I had already spent a fair amount of time in Dublin, seen dozens of gorgeous churches across the island, hiked through Killarney National Park, and explored one of the world’s most beautiful gardens in Enniskerry. I was saving one of the country’s most famous sights for last. I parked my rental car and began to walk on the trail, past the woman in a pea-green cardigan playing a harp, until I came close to the abrupt edge of the world and gazed out at the vast blue expanse of the Atlantic Ocean, with nothing in it between here and my hometown of New York. On either side of me, below the ground where I stood, the Cliffs of Moher rose up dramatically from the ocean. Nearly perfectly vertical cliff faces soar as high as 702 feet. Layer upon layer of shale and sandstone, 350 million years old, form a formidable wall of rock that runs about eight miles along the coast. And atop of it all lies a great expanse of yellow-green coastal grass. I strolled along the well-trod walkway to O’Brien’s Tower, an observation tower built in 1835 by the local landlord. I kept walking until I sat among the flittering blades ruffled by the ocean breeze, a dot of blue denim and t-shirt amid all the green, alternating my gaze between the cliffs below me, one of more than 20 species of seabirds that occasionally flew by, and the lone sea stack called Branaunmore, an isolated, forever-eroding rock tower just off the coast, rising 220 feet above the ocean surface. 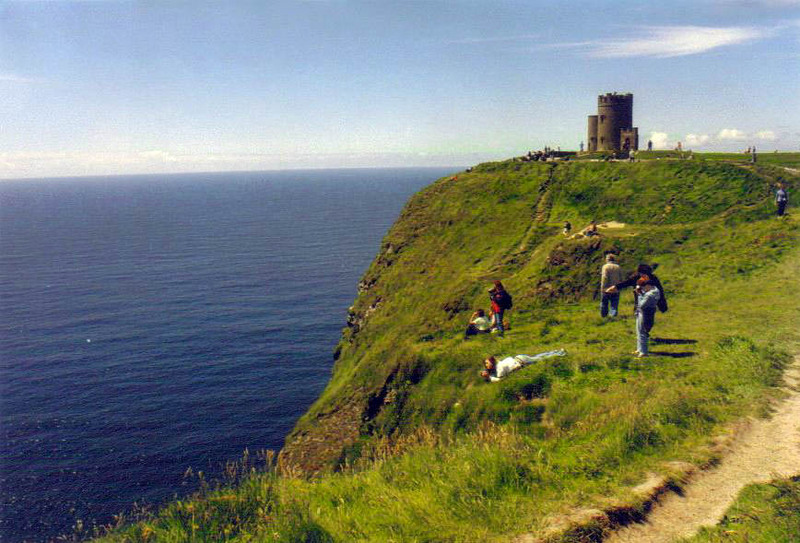 Green is often associated with calm and tranquility, and the Cliffs of Moher is one of the best places in the world where you will find the association true. Malachite shows up again, here at the Metropolitan Museum of Art in New York City. The largest museum in the United States boasts an enormous collection of unforgettable art, and one of its many pieces that will grab your attention is the gorgeous Monumental Vase, housed in the European Sculpture and Decorative Arts section. 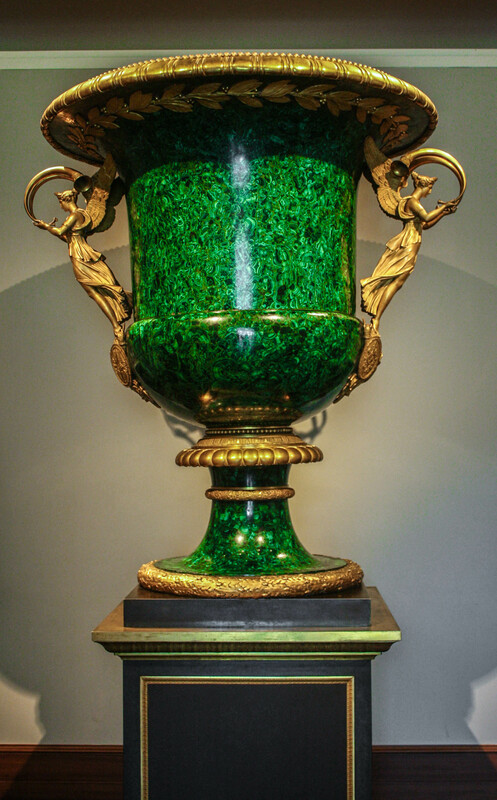 Created around 1814, this highly polished bright-green malachite vase made its way from its origins in Russia to a Florentine villa to the Vanderbilt family in New York, eventually landing at the museum when Mrs. Cornelius Vanderbilt sold it in 1944. The vase stands more than five feet tall, with a circumference at the top of more than four feet. Although it looks as if it were fashioned from one piece of malachite, that’s not the case. Malachite’s brittle structure precludes it from lending itself to large objects, like this one. Rather, a core structure is fashioned with thin pieces attached to it. Talented Russian craftsmen were able to combine malachite’s natural pattern with an exacting cutting technique to give larger objects an almost seamless appearance. The striking pattern resembles what you might see if you observed algae under a microscope, swirls of beautiful deep green that almost seem to billow before your eyes. A gilded bronze garland of laurel encircles the vase under the lip mount, suggesting Victory. Mounted on both sides of the vase, winged female figures in gilded bronze, standing atop a headless torso of a solider bearing a shield, represent Fame. They hold trumpets, hinting at an announcement of great import, that are shaped like handles. Despite all its allusions to winning, no human would ever be able to lift it in triumph — the vase, including its pedestal, weights almost 1,600 lbs. I exited the Hotel Phoenicia, my wonderful accommodations in Floriana, and walked for all of one minute before entering Valletta, the Maltese capital. 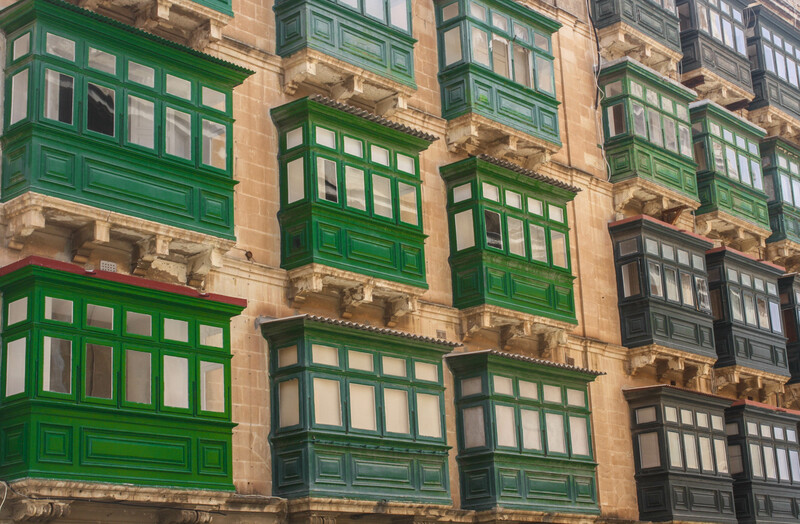 The first thing I noticed was the monochromatic color of all the sandstone buildings, soft beiges and buffs, handy in reflecting blistering hot summer sunshine and handsomely washing Valletta in a uniform hue. With that as the background, the colorful wooden balconies that I saw absolutely everywhere really come to life, and the green balconies were my favorite. Although all of them are beautiful, the red and the purple ones seemed too bold, the cream and the yellow ones blended into the buildings too much, and the blue ones presented too much of a contrast. The green ones, however, struck the perfect balance. These small-scale closed wooden balconies began to show up in the 1700s and quickly grew in popularity, filtering down from the ruling class to the affluent and then the less affluent classes. Arabic in origin (no surprise here; the Arabs were one of many peoples who made their mark on this island nation, smack in the middle of the Mediterranean), these ubiquitous balconies protrude from buildings throughout the city, resting on stone brackets. A row of sealed windows runs across the top and sides, a row of larger functional windows spans the center section on all three sides, and a row of wood panels anchors the bottom. This design allowed Arabic women to be able to look at the world outside their homes yet retain the prescribed modesty and remain out of the eyesight of men. Of course, their visual appeal attracted non-Arabs, who adopted the structure as their own, expanding the function over the centuries. These practical extensions bring fresh air and natural light inside the home, and the extra floor space provides an area for, perhaps, drying laundry or growing plants à la a small conservatory. True to their original purpose, they still provide an observation point for residents to watch the world, and their neighbors, go by, but women today often lean outside to see what’s going on rather than remaining hidden behind the glass. And, thanks to Valletta’s undulating streets, I was able to view them from all vantage points, whether I was standing below one at the base of a building, or looking at third- or fourth-floor balconies at eye level when I was halfway up one of the city’s steep streets, or gazing down at them from the top of a hill.